MT. PLEASANT —A proposed sewer rate increase was the primary issue at a public hearing last Tuesday, May 23, on the 2017-2018 Mt Pleasant city budget. The proposed budget includes an increase of $6.50 in the base rate charged to all connections. That increase will raise the base rate from $10.50 to $17. Under the proposal, after this year, the base sewer rate would go up 5 percent per year automatically. The budget also calls for increases in overage rates. The reason given for the rate increase is that the rate has been raised only once since 1982. In that time, sewer system maintenance has been grossly neglected and now, major repairs are needed. Sam Draper, Mt. Pleasant public works director, explained the need for the increase. While noting that the sewer rates in Mt Pleasant were lower than in every other community in Sanpete County, he said “I don’t believe in raising rates because everyone else’s is higher.” But he said neglect of the sewer system for years made the rate increase a pressing concern. Mt. Pleasant City Treasurer Dave Oxman said that just to break even with the projected cost of needed maintenance, the increase would have to be to at least $15—far less than the amount proposed. Jeff MacDonald, former council member and a perennial opponent of any tax or spending increases, was at the hearing. “I don’t think there should be any raise,” he said. He contended the increase proposed in the new budget was be more than the community could bear. Instead, the city should look to cut other parts of the budget. “We should tighten our belts elsewhere,” he said. Councilman Justin Atkinson responded to MacDonald. He said that the increase was to rectify the past neglect of the system. The addition of a 5 percent yearly increase was designed to avoid hitting citizens with a huge increase all at once. Mayor David Blackham added that according to state law, any community has to run its enterprise funds (i.e. utilities, sewers, roads) separately from the general fund. A city cannot draw funds from the general fund to cover costs of repairs or maintenance in utilities that are designed to be self-supporting. At the end of the hearing, Mayor Blackham reminded those attending that the budget would come up for final approval during the city’s June council meeting. 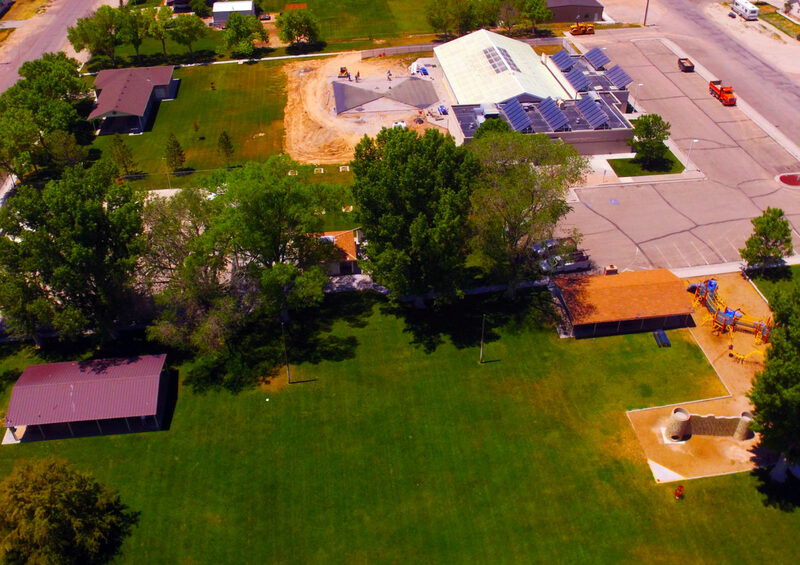 The Gunnison City Park will be getting a new method of protecting Fourth of July celebration attendees from the heat of the sun through a partnership with the Gunnison Lions Club to replace the old parachute canopies with new modular event tents. GUNNISON—The Gunnison Lions Club made a proposal to the Gunnison City Council to join in a partnership with the club to improve the city park through the addition of large tents which would replace the parachute canopies erected for shade during the Fourth of July celebrations. The proposal was made at the recent meeting of the council on Wednesday, May 24. As the club president, Dr. Richard Nay acted as their spokesman at the meeting, and there were about a dozen more members in attendance for the proposal. Nay said the club had thought some event tents would be a good addition in place of the makeshift parachute canopies, which currently offer about 120’ by 30’ of shade. Nay said, after looking into what would be involved, the club had discovered there were basically two main options for the sort of event tents that would be optimal. The difference between the two tent options was that one offered a high peeked center, but accomplished it by having a center pole. The second option was a flatter, less vaulted ceiling tent, but without a large center pole to get in the way or obstruct vision. Nay said both tents came in the option of eight or 10-foot tall walls. “We think for big events, the 10-foot tall tents would be best,” Nay told the council. Another important factor to the club was the overall size. They wanted at least 100’ by 40’, and they could get that one of two ways, by either buying a single large 100’ by 40’ tent, or by purchasing two 60’ by 40’ tents that’s connect together if desired. “Getting the two smaller tents would give a greater degree of flexibility, we think,” Nay said. Nay said the cost for the tents would be $20,000 to $23,000, depending on which configuration they decided on, but only the less vaulted tent or tents with no center pole could be shipped in a way that could arrive in time for the Fourth of July celebrations. Nay said if they did purchase a tent or tents to replace the parachute canopies, they could be put in a similar placement as the canopy, and are engineered to withstand a 60 mph wind—the equivalent of a category-one hurricane. Nay said the club raised roughly $14,000 from their Fourth of July auction, but also said they got a late start so they expect to raise more, so the difference the city would have to make up might not be as much as they thought at first. Councilman Shawn Crane made a motion that the city agreed to partner with the Lions Club and front the cost of the tents so the city could have the tents in time for the Fourth of July Celebrations. As part of the proposal, the Lions would pay back the city through the money raised from the Fourth of July auction, and the city would make up the difference in cost. Crane’s motion passed unanimously in a vote from the council. 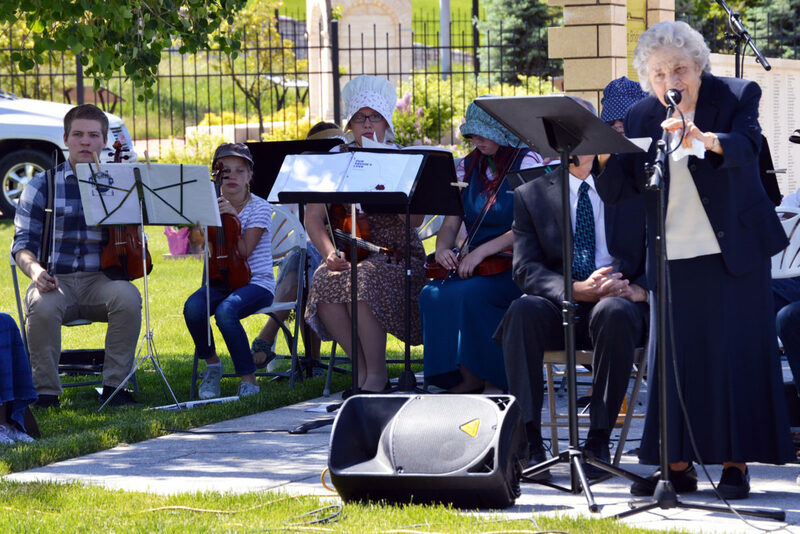 Jane Braithwaite, co-chair of the Manti Heritage Ad Hoc Committee, speaks at the dedication of the Garden of Treasures Under Temple Light, a project designed to beautify the new entrance to the Manti City Cemetery. 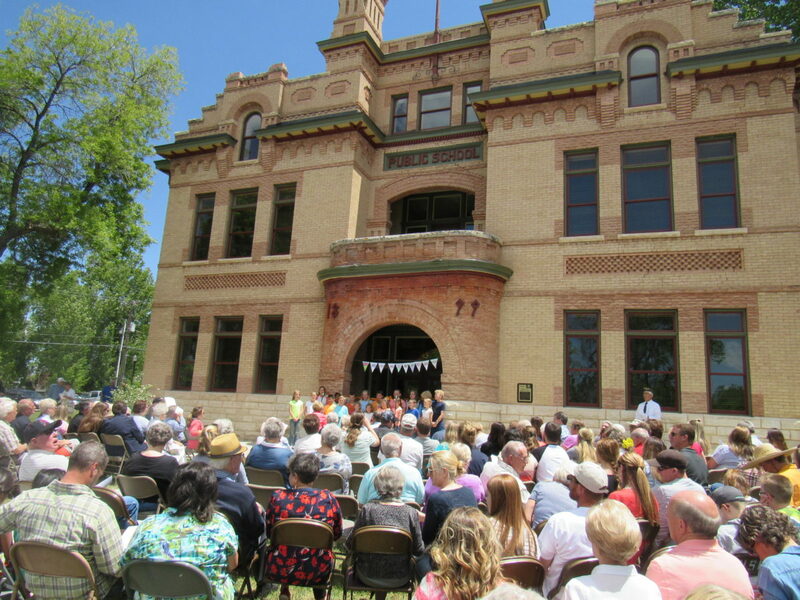 A crowd gathers on the lawn to dedicate the Historic Spring City School after restoration is completed. 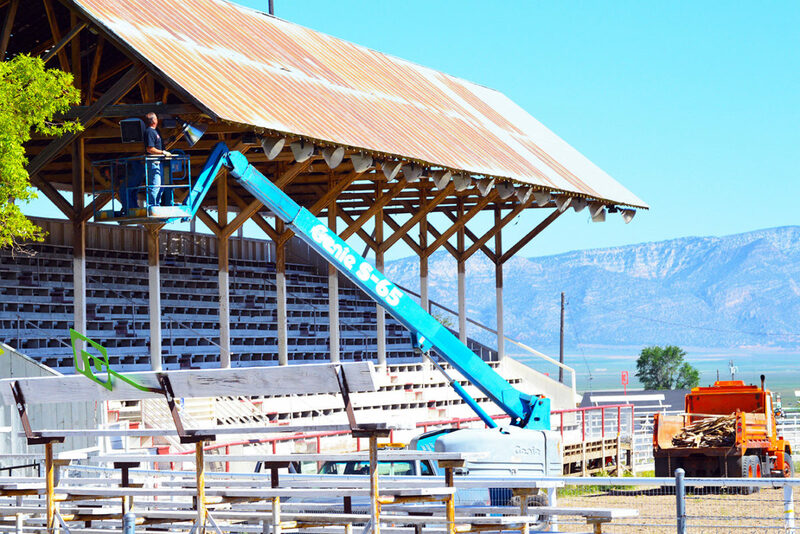 Sanpete County employees begin dismantling the fair grandstands on Tuesday after the Sanpete County Commission declared the structure to be a “danger to bystanders.” The commission directed that the stands come down before a Cub Scout day camp is held at the fairgrounds this weekend. 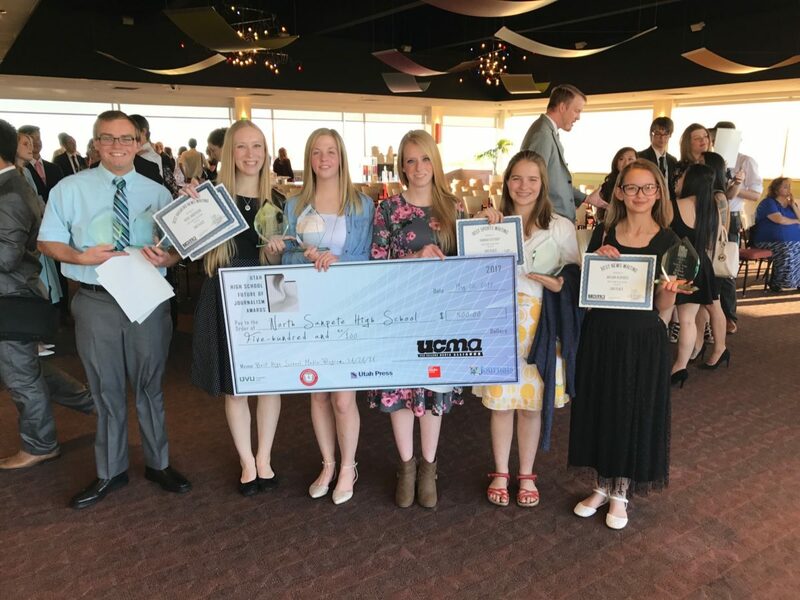 North Sanpete students pose with the check they received for coming first in a state journalism competition. From left are Abraham Bunting, managing editor; Addie Anderson, features editor; Avery Briggs, editor in chief; Makenzy Palmer, managing editor; Hannah Ostraff, photo editor; and Megan Aldridge, arts editor. In the seventh annual Templar Classic 3-on-3 Soccer Tournament held on Saturday, May 20, 52 teams competed across eight divisions. 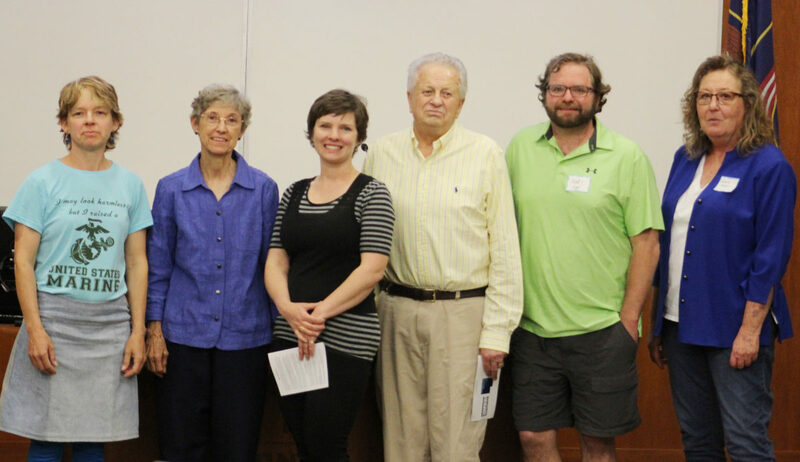 Elected to offices in the Sanpete County Democratic Party are (L-R) Deborah Woodbury, central committee member; Lianne Hirst, Ephraim, first vice chair; Serenity Kimball, Hideaway Valley, chair; Cliff Birrell, Ephraim, central committee member; Andy Hyer, Ephraim, treasurer; and Debra Fraser, Ephraim, central committee member. Not pictured: Jill Hansen, second vice chair; and Robert Buckner, Spring City, secretary. EPHRAIM—Sanpete County Democrats heard candidates for state party office describe the party as in step with Utah values and family values at their county convention last week. At the gathering Saturday, May 20 at the Huntsman Library Auditorium at Snow College, local Democrats also chose their party leaders for the next two years. Peter Carroon, former Salt Lake County mayor who has served two terms as party chair is stepping down, and more than a dozen candidates are running to replace him. Another half-dozen candidates are running for state vice chair. 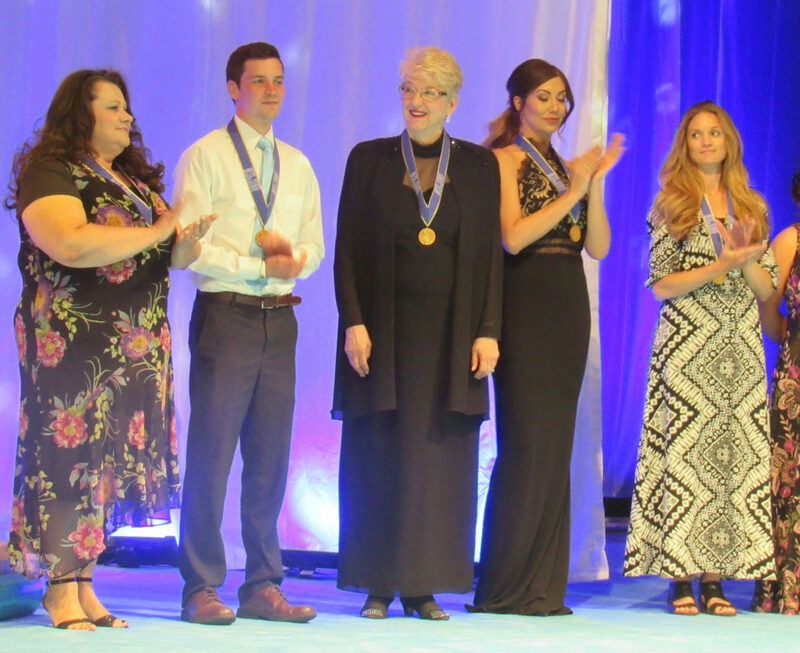 The races will be decided at the state party convention June 17 in Salt Lake City. Carroon, eight candidates for state party offices and one candidate for U.S. Senate in 2018 were at the Sanpete meeting. Several state party candidates said the Democratic Party’s stands on social justice and equal opportunity conform to what most Utahns believe. “Our values are Utah’s core values. We are the party of family values,” declared Margarita Santini, a former Snow College student who is running for state vice chair. Although Sanpete is overwhelmingly Republican, there are 600 registered Democrats, party leaders noted. Two tributes to long-time Sanpete Democratic leaders were presented. Debra Fraser read a tribute to Avrin Brotherson, who has stepped down after more than 10 years as county party treasurer. Brotherson’s husband, Boyd, accepted a spray of flowers for her. “She brought a steady voice to the table,” Fraser said. Fraser recalled the first time Barak Obama ran for president. That year, Avrin and Boyd Brotherson loaded local and state Democratic candidates in their pontoon boat and pulled the boat in every parade in the county. A tribute to Fraser, written by Jill Hansen, was also read. Fraser has been in county party leadership for more than 10 years. 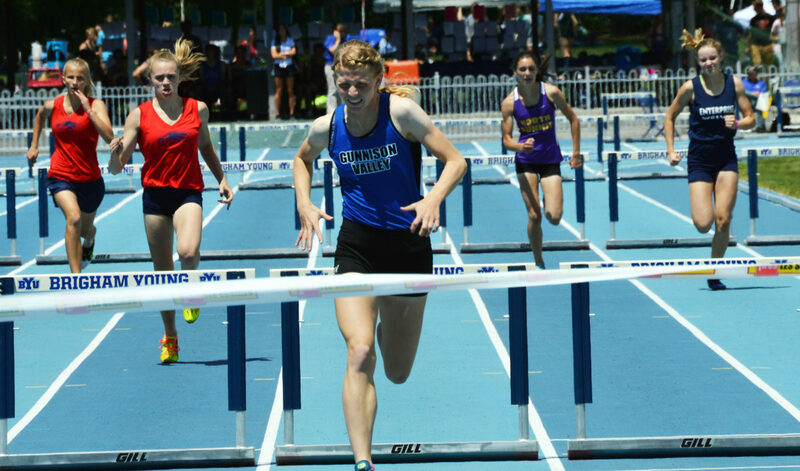 “She got things done and done right,” Hansen wrote. “…She deserves our gratitude for many years of quiet, dedicated service. Elected to fill county party offices for the next two years were Serenity Kimball, Hideaway Valley, chair; Lianne Hirst, Ephraim, first vice chair; Jill Hansen, Manti, second vice chair; Robert Buckner, Spring City, secretary; and Andy Hyer, Ephraim, treasurer. Members of the central committee will be Debra Fraser, Ephraim; Deborah Woodbury, Manti; and Cliff Birrell Ephraim. Debra Fraser (left) received a spray of flowers recognizing 10 years of service in the Sanpete County Democratic Party leadership. 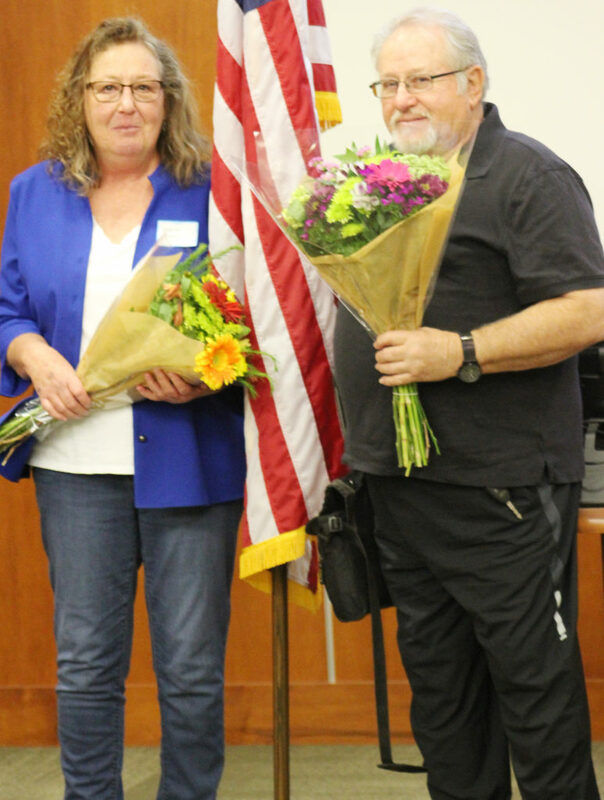 Boyd Brotherson (right) accepted flowers in behalf of his wife, Avrin, who has stepped down after more than 10 years as county party treasurer. This rockslide has blocked 12-mile Canyon Road, and District Ranger Kyle Beagley says it is unlikely the road will be open in time for Memorial Day weekend. 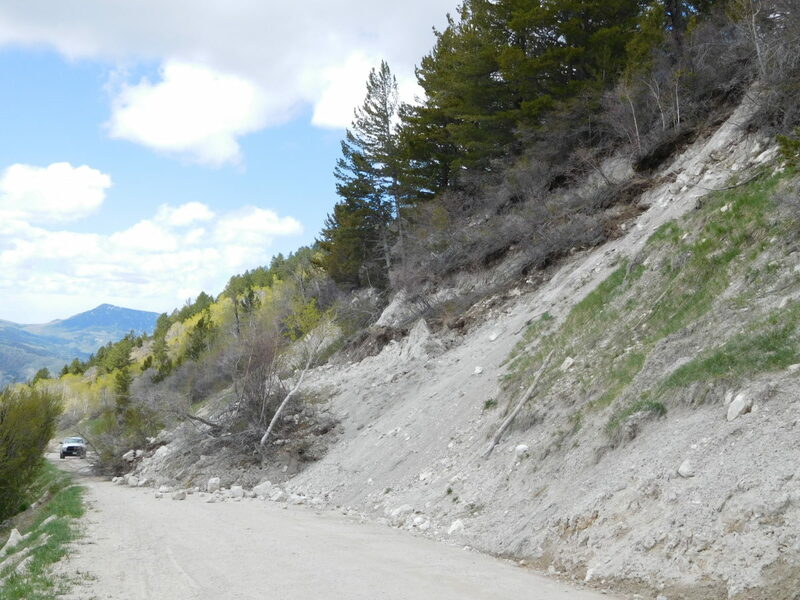 MAYFIELD—A rockslide has blocked traffic on 12-mile Canyon Road, and the Forest Service predicts the road may remain closed through Memorial Day weekend. According to District Ranger Kyle Beagley, the slide happened just below Spring Hill on 12-mile Canyon Road. Beagley says the Forest Service has begun the task of getting equipment on site to begin clearing the slide earlier this week, but it may not go quickly. Beagley says the road will remain open up to and above Town Reservoir, the point of closure will be at the base of the dug way below Spring Hill. At this point in time the road is still snow covered just a mile beyond Spring Hill. 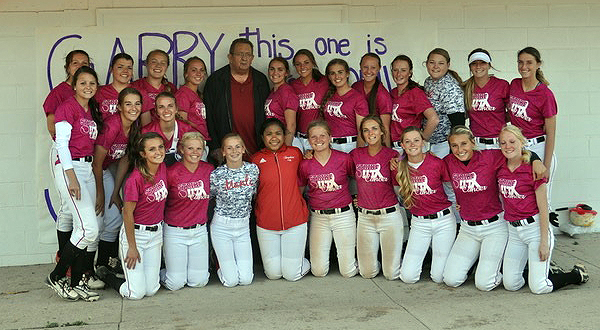 Bus driver Garry Bringhurst has the support of “his” girls as he battles cancer. 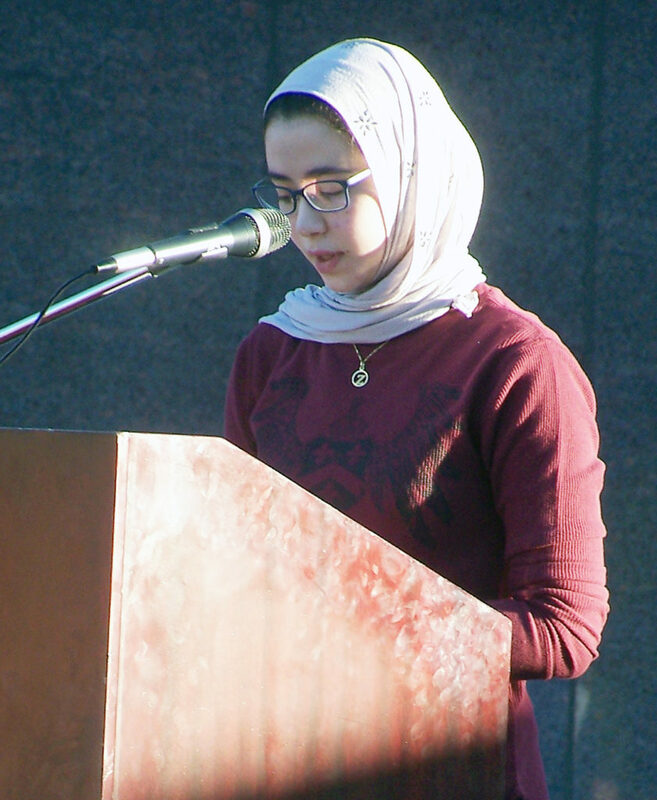 Zinab Badawi, a Snow College student from Egypt and a Muslim, asks God to look with compassion on the whole human family during a National-Day-of-Prayer observance. 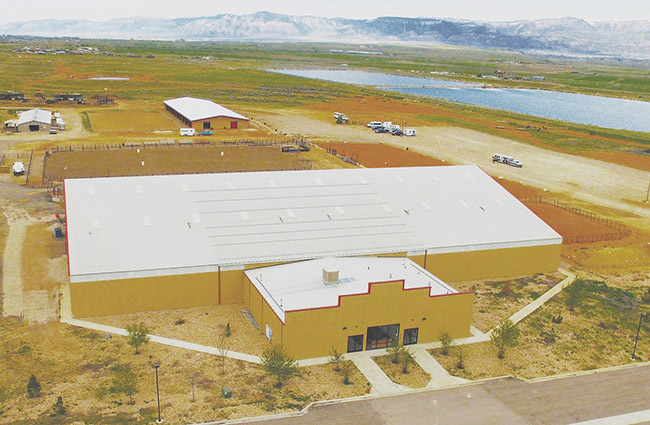 The ConToy Arena has become a hub of equestrian activity and is poised to be a community asset for North Sanpete for some time. MT. PLEASANT—The ConToy Arena has become a hub of equestrian activity that goes beyond traditional cowboy rodeo events, and as a result, is poised to be an economic and cultural boon into the future. The change that has put the arena in the spotlight is the addition of what is called the Skyline Eventing Course. The course supports the kind of riding events seen at the Olympics, including dressage (which is performance of various riding tests), cross-country and show-jumping. People are coming from all over the West to attend eventing meets at ConToy. The arena was born out of discussions that took place several years ago when county leaders were considering moving the county fairgrounds out of Manti. An ad hoc group, which included Gary Anderson of Ephraim, Steve Clark of Chester and former Mt. Pleasant City Councilman Monte Bona, among others, began asking “what if” and reached the conclusion that if the fairgrounds were to leave their current location, a spot near the Mt. Pleasant Industrial Park on the south end of town would be ideal. The committee created a concept for new indoor and outdoor arenas suitable for all fair events. But the county commission sacked the relocation idea in favor of holding to tradition. By then, however, the seed of a Mt. Pleasant arena had taken root with committed “horse people” in northern Sanpete County. Bona helped shepherd the idea through approval by the Mt. Pleasant City Council. The city searched for funding to build the arena and was able to win a $565,000 grant from the Utah Community Impact Board. The city also issued a $1-million revenue bond. On top of those sources, the city secured a promise from Wasatch Academy to pay $20,000 pr year for use of the arena for its student equestrian program. The ConToy Foundation, a Utah foundation with an interest in horse-related activities, donated $125,000, and the George S. and Dolores Dore Eccles Foundation contributed $305,000. In the beginning, the arena was used primarily for barrel racing. Jack Widdison, manager of the ConToy, said use of the arena was sparse. Few people purchased memberships. Then, with the help of a $50,000 GoFundMe campaign, the Skyline Eventing Course was developed just outside the indoor arena. Since then, English-style riding has really taken off at ConToy. Gayleen Widdison, co-manager of the the arena, attributes the growing of eventing to Ellen Walker of Mt. Pleasant. “Ellen Walker was the one who introduced English riding to Sanpete County.” After her passing last year, the arena honored her memory by naming a permanent horse jump on the eventing course after her. Word about the Skyline course has spread through the eventing community. The course was recently certified by the United States Eventing Association (USEA). The number of riders competing at the ConToy events continues to grow as the course reputation spreads. A new organization, Skyline Eventing, schedules and runs eventing competitions and classes. On May 5-7, the Spring Event, a USEA-sanctioned competition, was held, drawing riders from all over the western United States, On June 30 and July 1, the Freedom Fest mini-event will be held. And on Oct. 6-8, the Fall Event, the USEA Area Championship, will be held. Jack Widdison sees a groundswell of interest in the English riding and eventing that will propel growth at the arena. A good indicator, he says, is the fact that 4H is now offering equestrian classes, where before it offered only general “riding” classes. And Wasatch Academy involvement should be perpetual help. 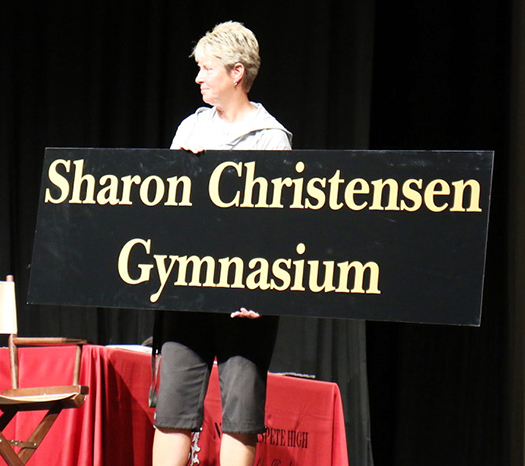 The indoor ConToy Arena will continue to hold events more “at home” in Sanpete. The Sanpitch Events Barrel Racing Association (SEBRA) holds races every other Monday. 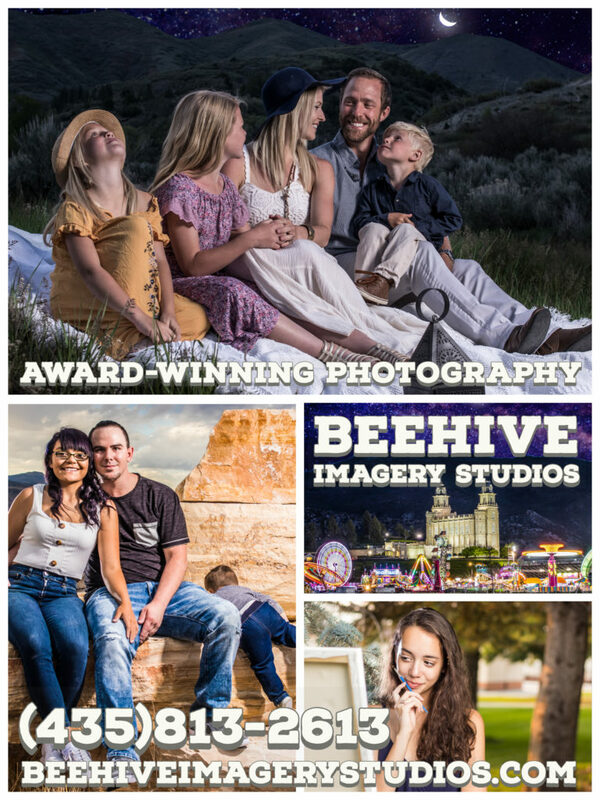 Wasatch Academy holds classes and training throughout the year. 4H gives classes at the arena as do local ranches involved in riding training. Even been dog training classes are being held on a regular schedule. 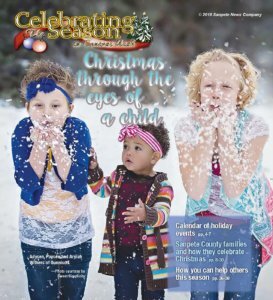 And the Sanpete County Sweetheart and Junior Princess pageants are held at ConToy. Significantly, the whole equestrian complex isn’t even finished yet. There are plans for an outdoor arena with seating for under-the-stars horse and rodeo events. Additional development of the arena complex may hinge on what happens nearby. Shopko has been in negotiation to build a store at a location beside the arena and at one time contemplated buying some of the intended arena grounds. However, the store is now more likely to only purchase land up to the edge of the grounds and has even suggested it would allow parking for arena events in its parking lot. 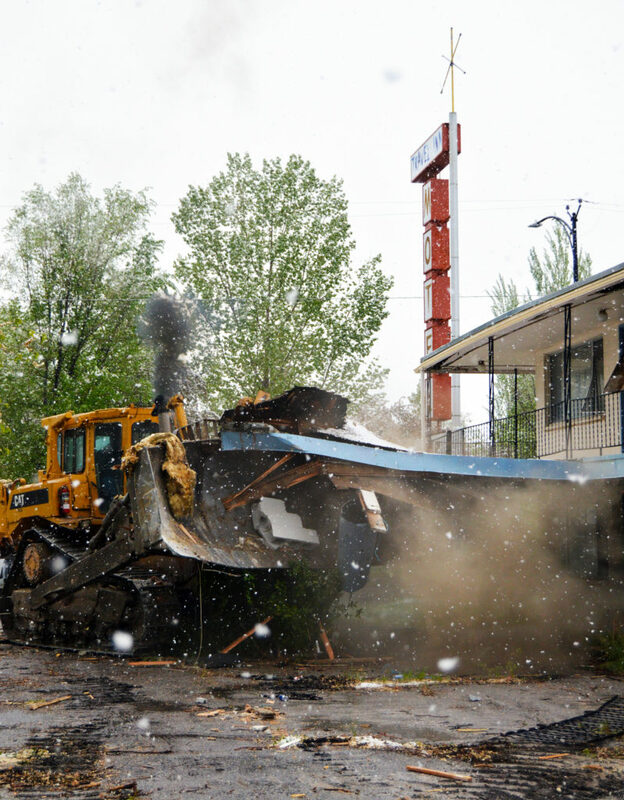 A number of investors and businesses have contacted Mt Pleasant about the former Mt. Pleasant Airport, which is next to the ConToy. One developer discussed the idea of building luxury houses on the airstrip with garages attached to house private airplanes. While confident the arena will do well in the near future, Blackham cautions that he must plan for the long-tern future. “In anything I do, I want to prepare for the worst-case scenario, to safeguard the public funds of the community,” he says. ConToy supporters “may think they’re running in the black, but the debt service isn’t considered,” Blackham says. The city’s commitment to pay off the $1 million revenue bond will last for 26 years, so he says he must make contingency plans in case of a reversal in the arena’s fortunes. He notes Mt. Pleasant has had inquiries into whether the city might someday sell the arena. The queries have come from educational institutions and even private individuals. As he puts it, “There’s options.” However, he said, sale of the arena would occur only after all other options were exhausted. But Blackham doesn’t foresee any changes in ownership structure in next four to eight years and believes growth in arena use should continue. 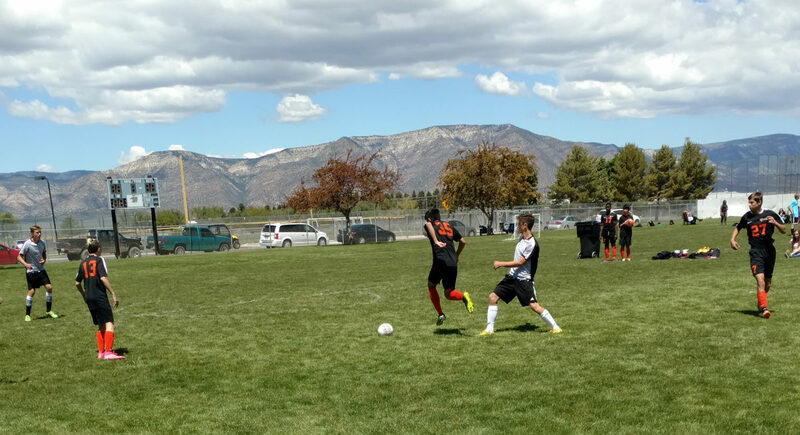 For that, he gives a lot of credit to Wasatch Academy. Blackham about horse ownership declining. Owning a horse is expensive, and fewer people own horses for agricultural reasons. However, he said, a committed core of “horse people” and strong leadership from the Widdisons give him optimism for the future. “I can’t see anything but a positive healthy future for the ConToy Arena as we move forward,” he said.